The blade is a curved blade, made from 1055 Carbon Steel. This carbon steel has a hardness of HRC 60-64, which allows it to maintain its sharpness and strength, while holding its durability. The carbon steel is drop forged, meaning it is differentially heat-treated. This means that the spike and chopping portion of the tomahawk is harder, while the middle section is softer and allows for more shock resistance. The overall length of the tomahawk is 21 inches, which is average in length, and perfect for both amateur and seasoned tomahawk-ers. The blade width is 6 � inches, and the edge length is 2 � inches. The handle is made from American hickory wood, and provides sturdy handling. Its natural wood finish is complementing to the black finish of the blade. At 23.6 ounces, this tomahawk is manageable for anyone who wants to have a firm grip on a light but strong tool. This tomahawk is perfect for taking out in the backyard to hack wood and chop smaller logs. The tomahawk is a versatile tool, lightweight with a shorter handle. 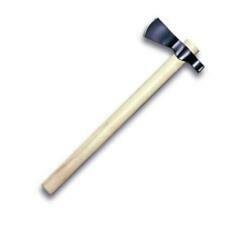 It is a great alternative to a hatchet, as they are slimmer and easier to transport. The Cold Steel 90TH Tomahawk is a great choice for those who want to have control over their tool, while still gaining the dependability and usefulness of a strong axe. Cold Steel TomaHawk Trail Hawk Throwing Axe 90TH 22"
Do you own or have you used the Cold Steel Trail Hawk 90TH? If so, rate it! Have you or someone you know purchased or used the Cold Steel Trail Hawk 90TH? How did it work? Share with the community!